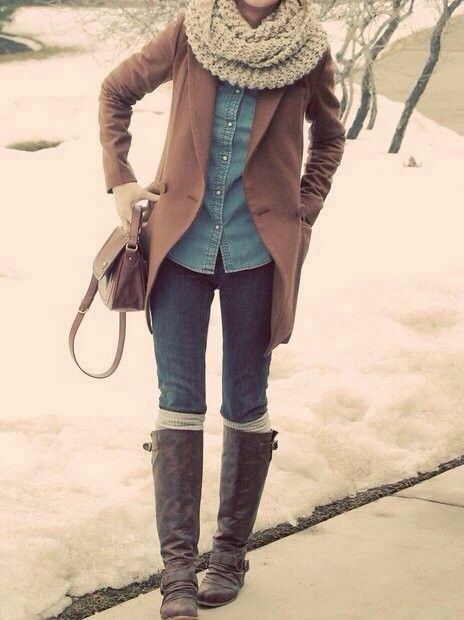 A cute combination of a winter outfit idea with brown boots, a tan coat, white scarf, and denim shirt. Top it off with some tan gloves, and a brown purse or bag. A cute preppy look for the winter, this outfit includes black jeans, black boots, black bag, silver scarf, and a silver blouse that just pops. Another preppy look for the preppy gal, this winter outfit idea includes a red top with a black winter vest on the outside and a feather necklace.